NOTE - This project is illegal to use or build in many countries. I accept no responsibility what-so-ever for any ilegal use. This circuit is provided solely as an educational project. Now I have got that off my chest, let me get on with the project. 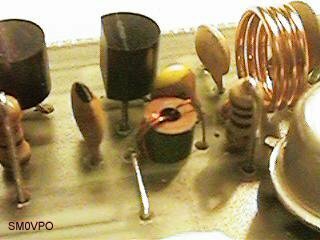 The 15pf capacitor couples the top of L1 to the varicap diode which serves to add more capacitance to the tuned circuit to alter the frequency. R1 adds the supply voltage to the varicap, with a little noise decoupling (the 0.1uf capacitor). If you are to use synthesiser control then it is important to remove R1 from the circuit, then connect the synthesiser loop filter output to the terminal marked "Ctrl". Audio is coupled to the BB105 via a 47K resistor. There is only 47pf of decoupling in order not to restrict the AF bandwidth of the complete transmitter. The AF bandwidth is flat from 3Hz to about 72KHz, but if we look beyond these limits, there is an increase of +6dB at DC. This is because the two 47K resistors divide the AF input voltage by 2, but at DC the 0.1uf capacitor has time to charge, the two 47K resistors do not therefore divide. TR2 (BC547) is both biassed and directly connected to the Emitter of TR1, which is a little unconventional in a VHF circuit. I needed to get a good input to TR2 and cut down on components. There are already far too many coils as it is in this circuit. Remember that the BC547 is an audio transistor but works well at VHF. The inductor in the Emitter of TR2 helps to extend the response a little to give a bit more signal to drive the final power amplifier transistor (TR3). TR2 gives no voltage gain; it is current we need to drive TR3. We already have enough volts from the oscillator. 22pf and L3 couple TR2 output into the Base of TR3. These components match the impedances so we get the maximum power possible into TR3 Base. 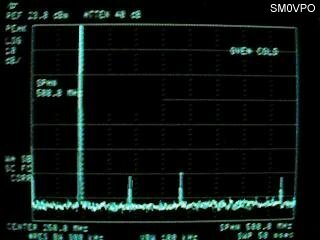 The signal level, however is still quite low, so some DC biasing has been added to turn TR3 ON a bit. The transistor should draw about 5mA with no signal. This is not enough to make it become linear, but it is operating around class "B". This would make a very poor frequency multiplier, so harmonics are also reduced a little by the DC bias. Note that NO emitter resistor has been used. The prototype units all worked well without one and the drive level is not enough to cause the transistor to conduct very much. The small standing DC bias of 5mA doesnґt even "tickle" TR3. In operation the DC voltage on the Base of TR1 will be negative due to the drive level, conduction of TR3 Base/Emitter junction and the 22pf capacitor. TR3 does NOT need a heatsink. 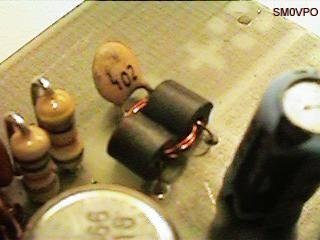 The collector of TR3 (2N4427) has a big (by QRP standards) choke to pass the supply DC, but presents a high impedance to RF. The RF signal is then matched to 50-Ohms with the 15p, L5 and 56p. The 1nf cap simply blocks the supply voltage that would otherwise pass to the antenna. L5 and 56pf form a low-pass filter that helps to block harmonics present in the output signal. L6 and 47pf are added to further reduce the harmonic levels. This filter is an absolute MUST for all transmitters if one does not wish to offend every other user of the radio spectrum. L5 and L6 have also been positioned on the PCB so that there is a little coupling between them. This coupling serves to cancel out any residual signals, not within the passband of the filter, that may be present at the input to L5. 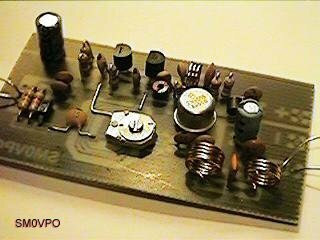 It is this effect that was responsible for the unexpected cleanliness of the first prototype, and a little layout experimenting has now reduced the 2nd and 3rd harmonics to -60dBc at all supply voltages. With 150mW output, this corresponds to 3rd harmonic of 150 nano-watts and a 2nd harmonic level of just 50 nano-watts. I have "played around" with the values and taken a few liberties. If you want to try adjusting the coils then then will be able to get another 2 to 3dB out of the TX. I have deliberately mis-tuned a couple of times in order that impedances and resonances will improve at the edges of the band. The result is that the performance of the transmitter does NOT vary (much) no-matter which end of the band you are operating at. As you will apreciate, L1 and the tuning capacitors all affect the frequency of the complete transmitter. Winding L1 has therefore NOT been considered. This would result in a spring-like affair that would cause instability, or more precisely, "microphony". 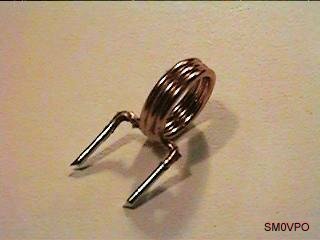 This is an effect where the coil wobbles about with very small mechanical movements. In severe cases you can even talk to the the circuit, as any owner of a Marconi TF995 signal generator will testify. By using a coil etched on the PCB you will find that microphony has been eliminated. So has coil expansion with temperature. It must be remembered, however, that this circuit is STILL based upon an LC circuit and therefore subject to changes of frequency with changes of supply voltage and "hand capacitance", etc. I will cover the supply voltage changes shortly. L4 comprises 6 turns of 0.15mm Dia. enamelled wire (magnet wire in the US) wound on TWO ferrite beads, the same beads that were used for L2. The beads are placed side-by-side as a pair of biniculars. One complete turn is when the wire is threaded once though both beads. L5 is 5 turns of 0.8mm Dia. enamelled copper wire with a 6mm inside diameter. Just as L3, wind it on a drill bit to get the inside diameter correct. The coil is also close-wound. Form the ends of the coil, bending them out then down so that the leads are 5mm apart. L6 is 3 turns of 0.8mm Dia. enamelled copper wire with a 6mm inside diameter. Just as L3 and L5 the coil is also close-wound. Form the ends of the coil, bending them out then down so that the leads are 5mm apart. You can get a closer view of L5 and L6 in this picture. 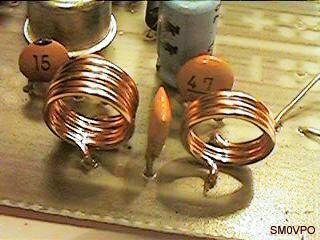 The position of the capacitor between them is very important, equal distance from both coils keeps the 2nd harmonic at the lowest level. NOTE - L5 and L6 MUST be wound in the same direction. If you try to wind one of them backwards or in the other direction then the spurious outputs will increase. The transmitter is constructed on a single-sided printed circuit board. I will place the PCB foil pattern on my DOWNLOAD section of the homepages. The board is only 40mm x 72mm. If you use any other construction method then you will need to change a few component values. If you use veroboard, prototype board then the project will probably not work. The board has been designed to compensate for the lack of a second copper ground land and has also "thermal breaks" around some of the component connections. This makes it easier to solder for new beginners (for me too, but I should not admit that!). I will shortly add a "broadcast" version that does not need any PCB additions for use as a broadcast transmitter. 2x AF inputs, even a prescaler chip on the board! You will note that the 15pf capacitor coupling L1 to the BB105 varicap diode is laying on the board. Itґs legs are so formed that it acts as a link. Assembly order is not particularly important, but it is easier if all horisontal components are mounted first, then the passive components (resistors/caps), transistors and the coils last. Neatness and attention to detail is particularly important. The vertically mounted resistors should all be mounted as shown on the component overlay. It DOES matter which way round they are. This is one of the prices for using a cheap single-sided board. When all the components have been fitted, check your work thoroughly. I reccomend you shine a strong lamp behind the board component side and compare the tracks with the PCB foil pattern. This will allow you to check for solder bridges between tracks. Assuming all is well, connect a 50-Ohm resistor to the antenna (ANT) terminals. Two 100-Ohms in parallel will be fine. Now connect the board to a 9v supply in series with a 12v 3W torch lamp. If the lamp glows brightly then switch OFF and check your wiring because you have a fault. If there is no fault then the lamp should only glow dimly, if it glows at all. The complete transmitter should draw less than 100mA. Now couple the AF IN terminals of the transmitter to the LINE OUT of a stereo ststem, your computer, or even the headphone terminals of your Sony Walkman. I prefer to use headphine terminals since the volume control will give you some control over the modulation depth. You can set the modulation depth by comparing it with another radio channel. Set your transmitter A LITTLE LOWER IN VOLUME than other channels, unless you have access to a modulation meter. Note that you may have to use a capacitor in series with the AF input wire. See the application data further down. Given that R1 is connected directly to the battery supply voltage, if the battery voltage were to vary then so would the TX frequency. You should really be using a stabilised power supply, or a high-current battery that has a fairly constant supply voltage. If this is NOT the case then you can use the CTRL terminal to bypass R1, without making any modifications to the TX. All we need is an external zener diode and a 6K8 resistor. The Zener diode should be as high as possible. If you have a 12.5v supply, for example, then a 10v diode would be great. With a 9v battery then a 6v8 diode is about the maximum practical. 8v2 would be Ok until the battery voltage went down a bit. We will asume that +VE is a 9v battery. If you are using DC modulation then the AF input will allow this. This can be used to give low frequency Frequency Shift Keying. This should only be done in conjunction with the voltage regulator above. If you are NOT wanting to have a DC shift, and your input source has a "DC Continuity" (resistance) then there is problem. If you were to connect a magnetic microphone or CD player, for example, to the AF input then the TX frequency would jump. You therefore need to add a capacitor to block the DC shift at the input. 10uF will do nicely. A 4K7 resistor should also be added to give a load to the audio source and to help prevent "hum" or "pickup" from 50Hz (60Hz) wiring. The value of the resistor should be selected to match the audio source impedance of the device. 4K7 is normal for computer and CD LINE-OUT signals. The resistor R1 may be removed from the circuit and the loop voltage from a synthesiser added to "Ctrl" on the circuit board. This will give the synthesiser a 10MHz tuning range, the preset capacitor determining the centre frequency. The loop frequency control voltage can be increased to about 20v but it should be maintained somewhere around 9v to get repeatable modulation characteristics. The coil of the tuned circuit can be reduced and TR1/TR2 replaced for more suitable RF devices, then the TX can be increased to the 144MHz band and modulated with NBFM. In this situation one MUST use synthesiser control to stabilise the frequency. Finally, is there any interest in my producing a kit for this project? I would include the input cap, pre-emphasis and Zener on the kit PCB, but there would be details showing how to bypass this for those who wish to do more than just send music. Please let me know at mailto:harryvpo@hotmail.com?subject=v7_kit keeping your mail short as possible, thanks. Very best regards from Harry - SM0VPO, Lunda, Sweden. Speek Portuguese,Como posso controlar V7 com mc145152 with mc12017 ,o mais simples possivel para operar 73mhz agradecido.